KFC gave us the bunless burger. McDonalds tried the surf ‘n turf. Now Hungry Jack’s has launched the wasabi burger. 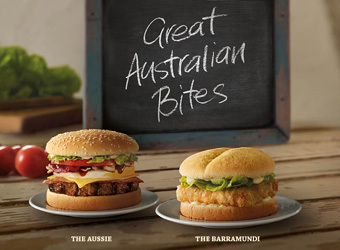 The purveyor of fast food is claiming a first for its category with the introduction of wasabi mayonnaise to its new burger, The Barramundi, launched as part of its ‘Great Australian Bites’ range. National marketing director for the chain, Jim Wilson, says the new burger proves Hungry Jack’s “fierce commitment to product innovation and trying something new”. Wilson thinks Australians’ tastes are adventurous enough to embrace the new flavour. “Perhaps more so than anywhere else in the world, we have very progressive taste preferences and are generally quick to adopt changing food trends,” he says. The new burger follows the repackaging of the chain’s cheeseburger into a mini format, a renovation of an existing product that successfully drove yield for the fast food chain by capitalising on the mini burger trend. The Barramundi will be available for a limited time, unless it shows more value than simply being a tool to refresh and add interest to the chain’s menu. Its release will be supported by a six-week advertising campaign created by Clemenger BBDO Sydney.